Roaring Jack Flyers - Check This Out! This one was published as an advertisement in Sydney's free music weekly, On the Street on 16 November 1988. Not only is it an ad for a show which had already happened (see previous flyer), but it also contains a classic printing error. Obviously the band in this photo is not Roaring Jack. 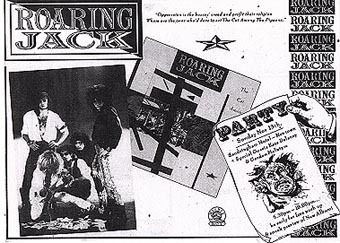 Indeed, the members of Roaring Jack would have been absolutely livid to see such a bunch of 'rock star wallies' gracing their ad! For the record, I think the true identity of the band in this ad is Sydney glam metal act, the Candy Harlots.